Tan ACCELERATOR & BRONZER 6 fl oz. Sunless Tanner and instant Bronzer in one lotion. One of the BEST 2 in 1 Sunless Tanners on the Market. GET A DEEP RICH TAN NOW. Our 2 in 1 lotion gives you an instant deep tan that looks and lasts like a real tan. This is a serious bronzer. Apply lotion for an instant bronze tone while our sunless tanning accelerator ingredient actually interacts with your skin to give you an accelerated rich lasting tan. Why not look and feel your best with a healthy tan from the Tropics. Made with Organic Aloe Vera, Vitamin E, Cocoa Butter, Coconut Oil, Anti-Oxidant Green Tea Leaf Extract, Walnut Seed Oil and our "Fresh Cut" Big Coconut fragrance. Sunless tanning accelerator and bronzer is recognized as the safest way to get your tan. Big Coconuts tropical lotions are designed to moisturize and protect your skin against the elements. Use as directed and you will have great results and softer skin. 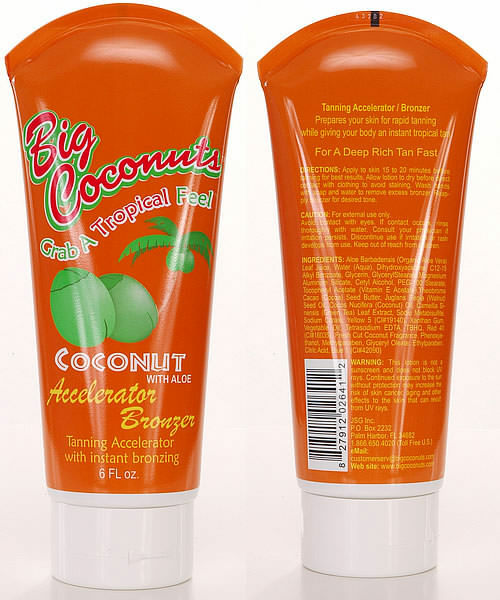 Big Coconuts features highend lotions with a fun tropical attitude for before, during and after the sun.